German startup N26 is now live in 17 European countries, but many features first launched in Germany and never made their way to other markets. The startup is slowly expanding core features to other key markets. That’s why the company is partnering with Younited Credit to launch consumer credit in France. It works pretty much like the existing credit feature in Germany. In the app, you swipe to the credit tab and answer a few questions about yourself. You’ll tell how much money you need, if you’re single or married, if you’re a homeowner, etc. 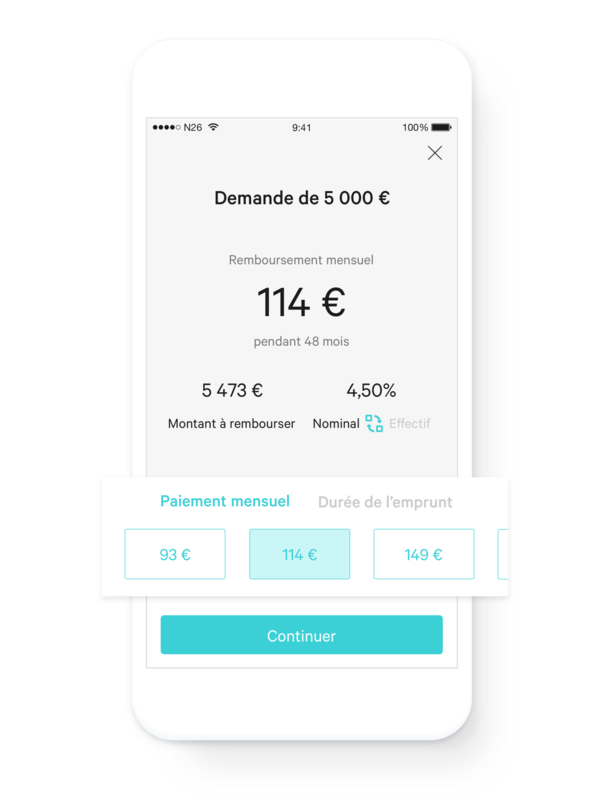 A bit later, the app will give you a clear quote telling you how much money you’re borrowing, how much you’ll end up paying in total, the effective or nominal interest rate and your monthly payments. You can also adjust your credit line by adjusting the length of the repayment process or the amount you’re willing to pay back every month. N26 doesn’t try to hide anything from you. If you’re not familiar with Younited Credit, the company is a leading crowdlending platform in Europe. The startup has recently raised nearly $50 million in its latest founding round. On Younited Credit’s website, consumers can borrow anything between €1,000 and €40,000 for 24 to 72 months without talking to an actual bank. N26 users access the same product without any restriction. The platform matches those credit lines with other users willing to lend money, as well as companies, pension funds, insurance companies, etc. And Younited Credit thinks it can build an efficient credit rating system from scratch. N26 users won’t have to sign up to Younited Credit to borrow some money. Everything happens in the N26 app using Younited Credit’s API. And I’m sure N26 also takes a small cut on each transaction. N26 recently partnered with Auxmoney in Germany to offer credit to more customers. It’s another credit marketplace, and it shows that N26 is willing to partner with multiple companies in the same space if it makes sense. N26 wants to build a thorough financial hub so that you’ll end up buying new all sorts of financial products through the N26 app.